I am very sad to report that my son may not have any culinary talents in him. Yesterday, we were grilling food for dinner and since he said he didn’t want rabbit or kabobs, he marched into the house and made himself dinner without telling anyone. He came back out with a peanut butter sandwich and a square of cheese, declaring that he was going to have a peanut butter and cheese sandwich. I think Grandma J talked him out of it, as he ended up eating the cheese first. Who knows though, maybe he’s a genius and I should try it. LOL! 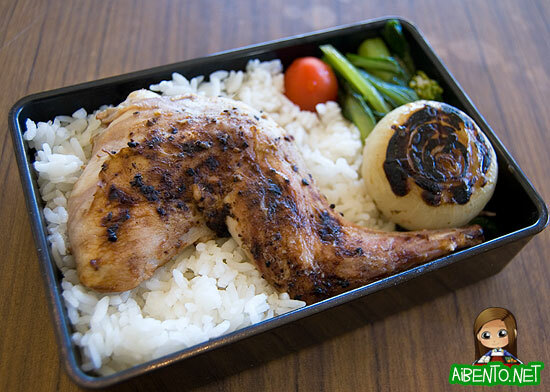 Today’s bento is a grilled rabbit leg on a bed of rice with some choy sum greens, a grape tomato, and a small grilled sweet onion. The rabbit was seasoned with some Emeril steak rub that I got from a Foodbuzz thing. I know I mentioned some of my yellow grape tomatoes, but I ended up using those on the kabobs I grilled, so I’m using red ones from the fridge until more yellow ones ripen. I posted the roasted rabbit on Fictional Food and Mockingjay and several people said the sight of it made them feel like yakking. One person said I was disgusting for raising an animal for meat. Because all that meat at the market wasn’t raised for the exact same reason. This week Thursday Buddy’s preschool teacher is retiring. Any ideas for a good parting gift?